Brian Summers (L) and Julian Cox are fired up for Playa's opening night. Anticipation is hitting a fever pitch this week for Playa, the new venture from Rivera chef John Sedlar opening on Friday, February 11th. 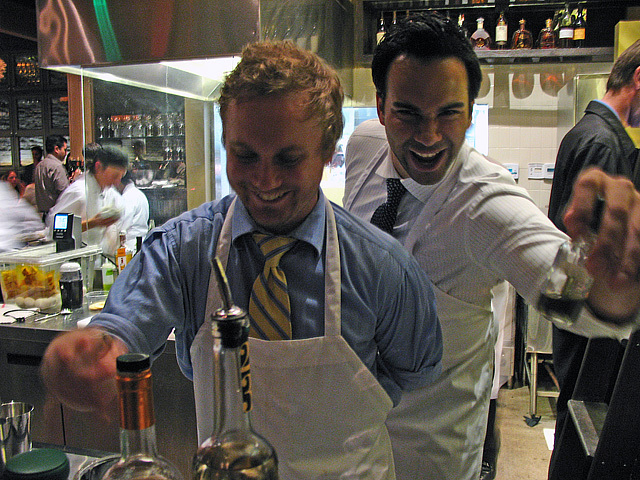 Foodies are salivating at the prospect of exploring Sedlar’s “Urban Latin Cuisine,” while cocktail enthusiasts are ready to sip the latest creations from Julian Cox, the acclaimed mixologist and 2010 StarChefs Rising Star. At a special sneak preview event last night, friends and family were among the first to sample Sedlar’s menu, selected cocktails, and glasses from sommelier Ben Broidy’s 130-bottle wine list. From the cuisine to its spacious, earth-toned interior, Playa is meant to capture “the spirit of L.A.’s open-air, laid-back, coastal lifestyle.” Unlike Rivera’s hidden-in-plain-sight facade, Playa features showcase windows that will surely tempt rush hour drivers to pull over and see what’s happening on the south side of Beverly Blvd. 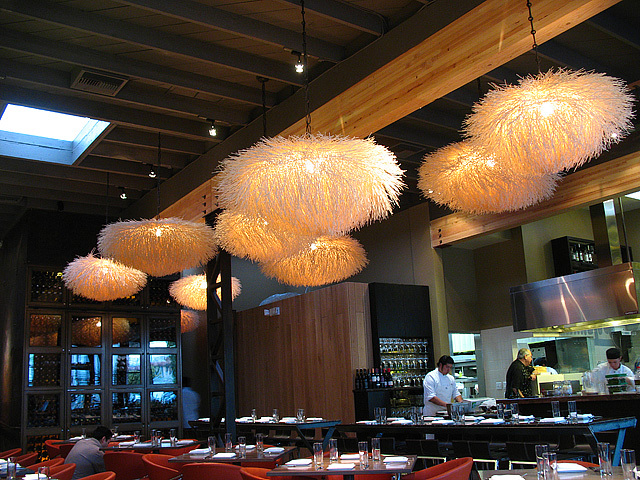 Playa's signature chandeliers evoke tumbleweeds, sea urchins, and possibly tribbles. When you enter the soaring, double height space (formerly home to Grace), the first thing you’ll notice are the striking, fibrous chandeliers, which evoke tumbleweeds from Sedlar’s hometown of Santa Fe. 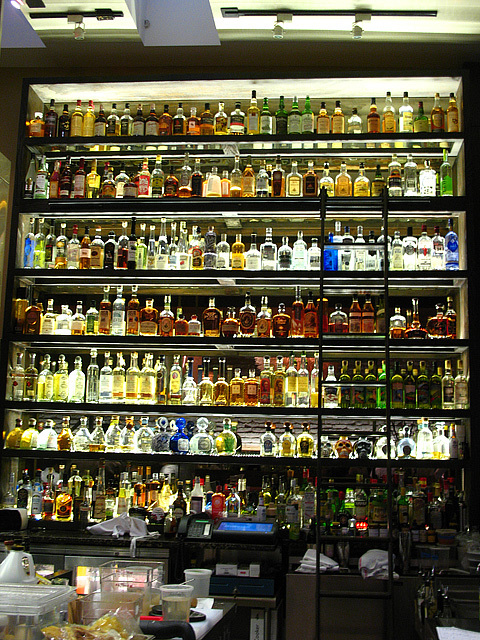 Be still my heart: the Great Wall of Liquor. Off to the right is a sight that will thrill many an imbiber: a wall of liquor that reaches to the ceiling, featuring a library-style ladder for those hard to reach bottles. A secondary wall with top shelf (literally) spirits is likewise accessed by the ladder. Visual appeal aside, it will be interesting to see how this design plays out on busy nights. The bar shares an open area with a station where maize cakes are made to order, while beyond is the glassed-in kitchen. Cox has assembled a formidable bartender team, with several that will be familiar to regular guests of Test Kitchen, Library Bar, La Descarga or Tar Pit. As final preparations for the preview wrapped up, I settled into a corner of the bar with Christopher Day (Dr. by Day), who will be working the Playa bar a few times a week and was lending a hand to set up for the event. 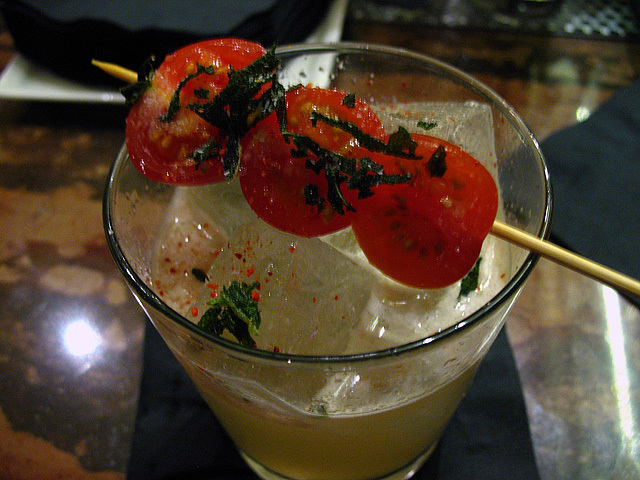 I started with Davidson Fernie’s A Oaxacan the Clouds: Del Maguey Mezcal Vida, lemon juice, agave nectar, garnished with roasted cherry tomatoes and fried sage, topped with a sprinkle of kosher salt and Piment d’Espelette. As luck would have it, my first cocktail at Playa was made by Jonathan Kleinbart, an old friend from SF who was previously at Swig. 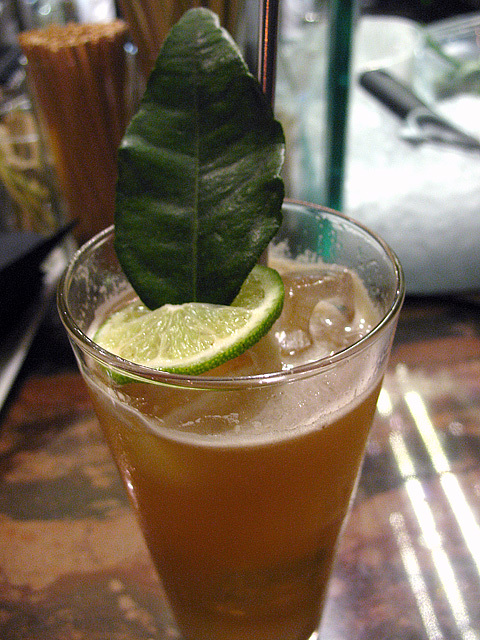 Fernie’s creation was the ideal introduction to Playa: balanced and smoky, with a hint of spice. A Bespoke Cocktail from Brian Summers, dubbed El Rodeo. One of the pleasures of drinking at a quality craft cocktail bar is going off-menu for improvised cocktails that are based on a guest’s spirit and flavor preferences. 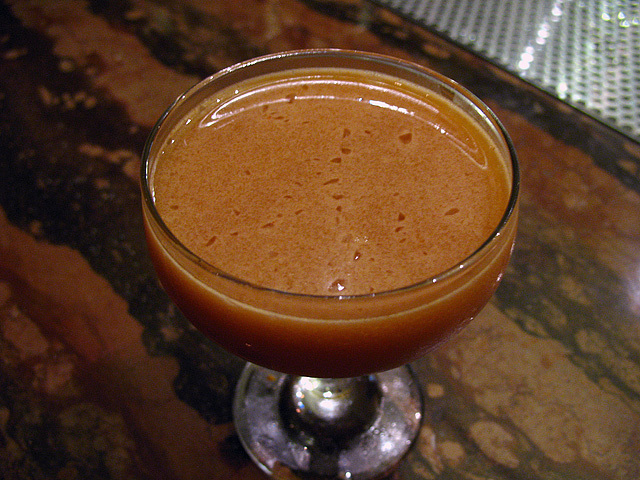 Case in point was the Bespoke Cocktail that Brian Summers made for Day, which was dubbed El Rodeo: Mezcal Vida, lemon, lime, cinnamon tincture, and a house syrup of toasted guajillo and arbol chiles that took Summers over three hours to prepare. One sip of Day’s drink and I had to have one as well. 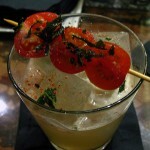 If the ingredients are available, I highly recommend saddling up to Summers’ El Rodeo, especially if you’re a fan of smoky and savory cocktails with a kick. Or have a Playa bartender create something else entirely; you’ll be in good hands. 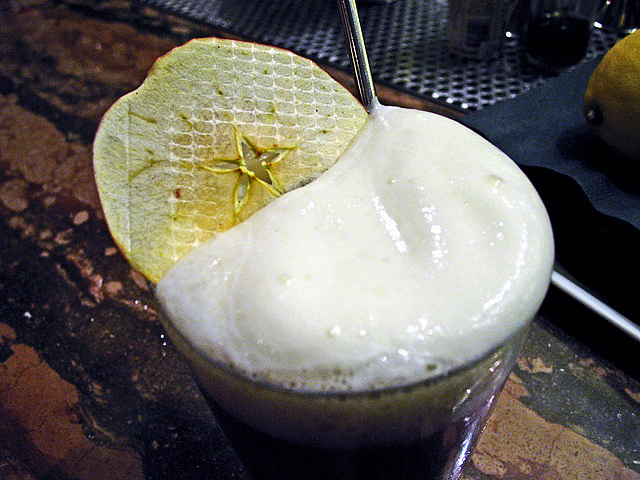 I’ll have to revisit The Grail, but the sip I had was intriguing and flavorful: 12-Year Apple Brandy, malbec, pressed apple, Don’s Mix, a splash of Mexican Coke, topped with an apple espuma and garnished with a dehydrated apple chip. Next was An Andalusian: 3 Ways, a cocktail made with slightly different ingredients, based on whether it’s ordered before, during or after the meal. 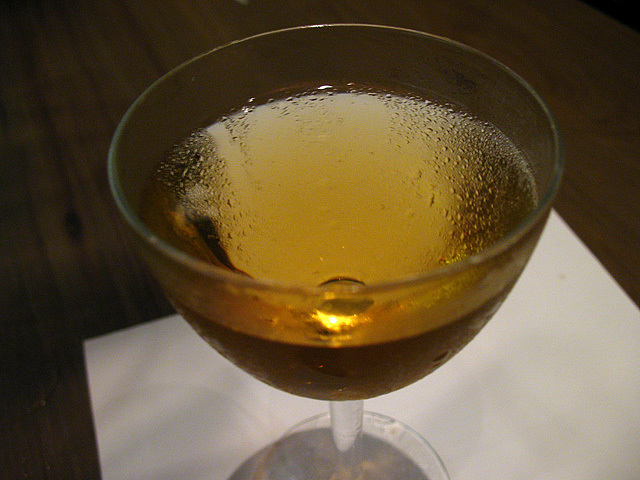 Like the cocktail itself, the variations are named after horses: Paso Fino, Palomino and Furioso. 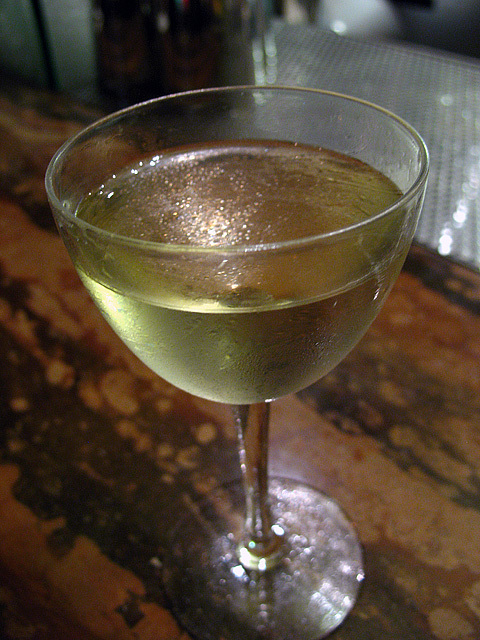 All three versions are made with Tequila Ocho Reposado, Cocchi Aperitivo Americano, and Spanish Vermouth. Then come varieties of Sherry: Fino, Amontillado, or East India. Finally, a twist of lemon, Meyer lemon, or grapefruit. The Paso Fino was well-balanced, bright and refreshing; a perfect segue from the bar to the table as we were seated for dinner. The Playa menu is divided into Cool and Warm (small plates), Big (mains), Sides and Desserts. The Cauliflower (Indian spices, green chiles, chana crisp) is an outstanding Side, while Rivera fans will recognize the popular Tortillas Florales. A Cool favorite was the Octo-Palm: grilled octopus, palm hearts, scallions, oven-dried cherry tomatoes and oven-dried red onion. Another standout was the Maize Cake Cauliflower x 3, with cauliflower three ways (caramelized, oven-dried, hibiscus-picked), oven-dried jalapeño, and curry. One caveat about this and other maize cake items: they’re excellent, but depending on your appetite and the size of your party, you may want to order several. To go with the Cool dishes, I ordered The Spice Trade: Dos Maderas P.X. (5+5) Double Aged Rum, kaffir lime tincture, lemongrass syrup, and Fever-Tree Bitter Lemon. In flavor and bite The Spice Trade reminds me of a Dark N Stormy, and its tanginess went well with our first plates. Highlights from the Warm items include the Tamalli Châteaubriand (wild mushroom duxelles dumpling, filet mignon, chipotle béarnaise) and the Arroz con Pato (duck confit, baby vegetable pickles, arroz blanco jus, Fresno chiles, chives, micro cilantro). Two other Maize Cakes were top notch, the Breakfast (63° egg, pan-seared potato, espuma de queso, black trumpet mushrooms, truffle cheese) and the Bombay Taj (pork belly confit, chile-lime jicama, mango pickle, masala, chana crisp, raita espuma). Of the Big items, the Twice-Seared Duck (garbanzo crème, pepitas, white and black sesame, blood orange olive oil) was particularly memorable. As with the Maize Cakes, the mantra with the mains is quality, not quantity. Several dishes were beautifully presented as part of an ongoing series that Sedlar calls Reflexiones. The interplay between the artfully designed food and imagery on the plate, the color and symbolism results in visually appealing dishes that are truly almost too pretty to eat. Almost. To wind down the meal I had the Palomino, which paired very nicely with the Warm and Big items. The Andalusian variations are more than just high concept; the changes in flavor profile are attuned to the guest experience and invite pairings throughout the evening. I never got to the Furioso, but I’ll be back to work my way through the cycle. I’m admittedly not a sweet tooth, but there’s no question that I’ll have the superb Luna Mezcal again: chocolate cake, chocolate glaze, mezcal ice cream, caramel popcorn, Spanish peanuts, hibiscus sauce, and blackberry basil sorbet. While the mezcal ice cream was the initial attraction, the delicious sorbet is what will tempt me on my next visit. The kitchen and bar were on point throughout the preview event, with dishes and cocktails executed to perfection. Diners lingered over their meals, table hopping and sharing recommendations. As the night progressed, the conversations and music grew louder and livelier, all part of a sophisticated dinner party that Angelenos can’t wait to attend. Playa opens for dinner on Friday, February 11, 2011.